It’s been raining a lot the past couple weeks. And I mean A LOT. So naturally, all I’ve been wanting to eat is an absurd amount of soup. Seriously. Cauliflower soup, butternut squash soup, doesn’t matter what it is. I WANT IT ALL. There’s just something about the cold rainy days in Fall that make soup taste just extra good. And there’s no feeling quite like having a belly filled with soup and feeling your entire body warm up from your head to your toes. mmm. To be honest, this is what I’m feeling RIGHT NOW. 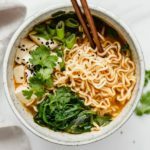 Because friends, I just finished eating a big bowl of this ramen noodle soup before sitting down to write this post. 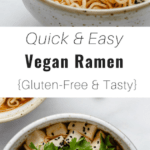 This quick & easy vegan ramen is EVERYTHING. Seriously. Homemade is the only way to go. The best part of this ramen has got to be how quick and simple it is to throw together. 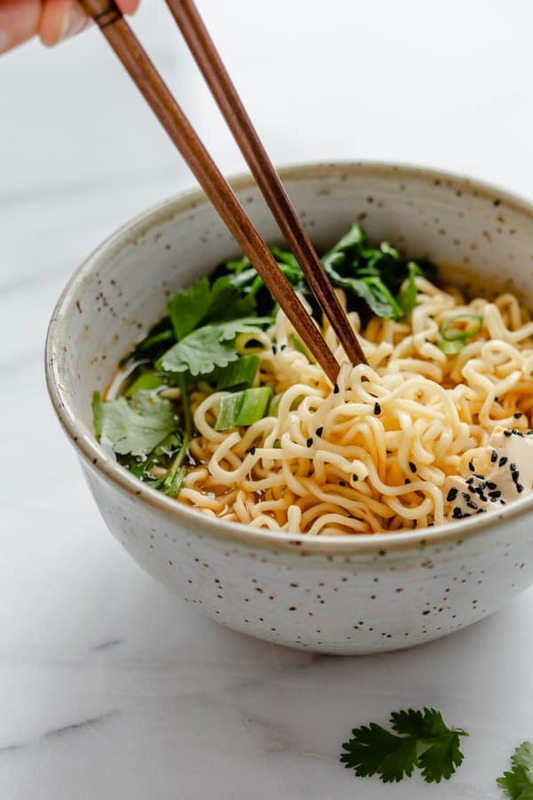 Maybe not as quick and simple as a Ramen packet where you just throw some flavouring into a pot, but hey, that’s the trade off for healthy, natural homemade ramen made with love. What makes this recipe so great, is the homemade ramen seasoning. 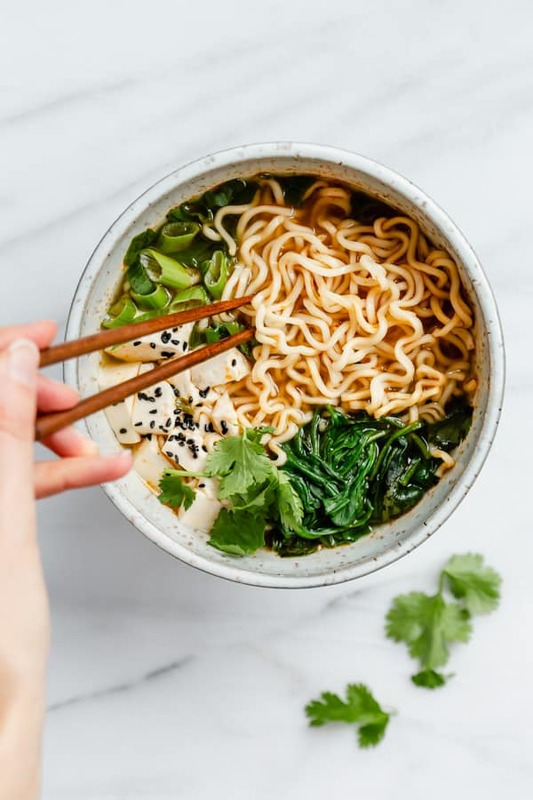 Yes ramen seasoning is easy to find in the grocery store and convenient to use, but it is loaded with sodium and fake ingredients we don’t want to put in our bodies! Really it is not hard to make the seasoning of tradition ramen. All you need here is dried shitake mushrooms, garlic powder, onion, soy sauce, miso paste and some vegetable broth! See not a lot! Ok. So broth, broth, broth. The broth is essential for making a full-bodied ramen soup. And since this is a vegan broth, we need to get that rich flavour elsewhere than in a typical ramen soup. So we’re adding in some dried shiitake mushrooms and some miso paste for that savoury flavour. (not to mention miso is super good for you too! )These are so important to give this soup that “OUMF!” that you want in a ramen broth. Although this recipe only takes 20 minutes to prep, the longer you leave the broth to sit the more intensified the flavours will become. So if your a planner, (Hello meal prep!) 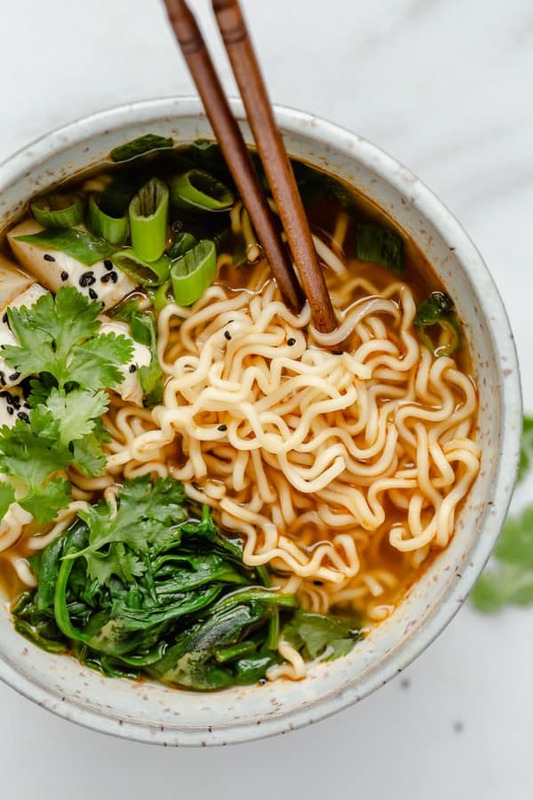 prepare the broth a day ahead of time for a flavour-packed ramen broth that’ll blow your socks off. As far as tofu goes, make sure to use soft tofu. (no extra firm tofu please!) We’re looking for a nice silky texture to compliment the soup broth. And of course, let’s not forget star of the dish: ramen noodles. I like to use organic whole grain ramen noodles, but you can use any type of ramen noodles you like. Opt for gluten-free if needed. 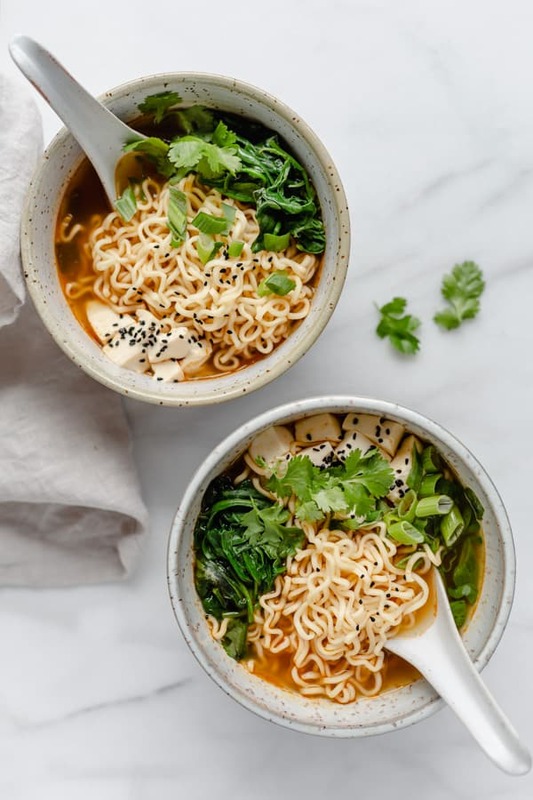 This ramen soup is perfect for a cozy night in and comes together in less than 30 minutes! Add the green onion, garlic and ginger to the pot and saute for 2 minutes. Next, add the dried shitake mushrooms and saute for another 2 minutes. Add the vegetable broth, water, soy sauce, miso paste and agave and bring to a boil, mixing well until everything is combined, then reduce heat to low, cover & let simmer for 10 minutes. (Optionally) strain the soup to remove the large chunks of garlic & ginger, or just remove them with a fork if desired. Raise the heat to medium, then add the tofu and ramen noodles, letting cook for 2-3 minutes until the noodles are soft. Serve with some steamed baby spinach, chopped green onion and fresh cilantro. This broth intensifies with flavour over time. Prepare the broth a day before you want to enjoy it to make it even better! Depending on how much sodium is in the broth you use, you may need to add a bit more or less soy sauce. Taste and adjust accordingly. YUM!! cant wait to try! Ramen !!! I agree with you !! Good for the London rainy days!!! Will try ! Thanks Ela! 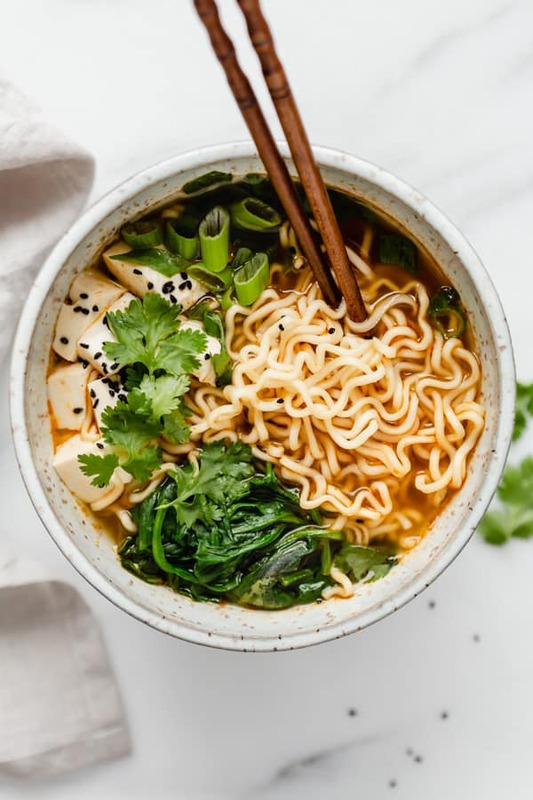 Ramen is definitely a necessity for Fall! Hi Sam, thank you so much! I’m so happy to hear you enjoyed the recipe 🙂 Definitely one of my favourites on a cold day! Thank you! and yes!! 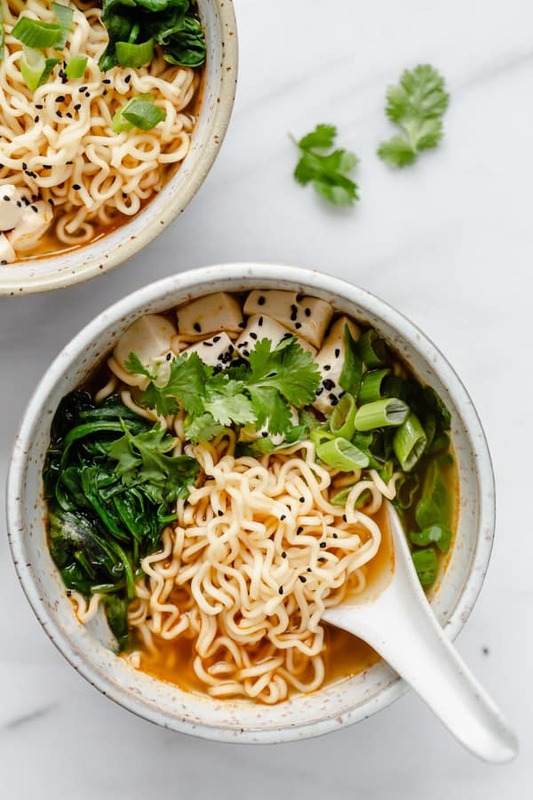 Wayyyy better than packaged ramen with just a little more effort! 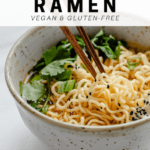 If you’re craving ramen (and I mean, who isn’t), this is a must! SO GOOD. Packaging says to reconstitute mushrooms. Is that what you did for your recipe? Hi Katie, yes you can just add the dried mushrooms directly to the soup or if you prefer you can soak them in some water for a couple minutes and then add them in! This is now my favorite go to lazy day food. I had to use Portobello mushrooms instead of shitake and I couldn’t find miso paste by in opinion it still tastes really good. Hi Daisy, I’m glad you enjoy the recipe! It really is perfect for when your feeling under the weather. I hope your husband feels better!